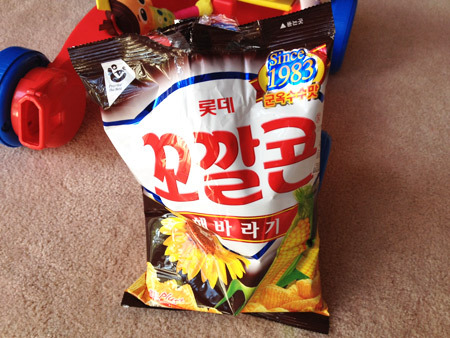 I’ve been into this Korean snack that I bought from Spud Shed the other day… This is exactly what I used to eat in Japan – “tongari corn”! Actually, when I look at the photos of Japanese tongari corn they look thicker than Korean one, but it tastes about the same. It got a hole in the bottom, and this is how people eat tongari corn…. Caps? Nail? People sometimes draw a face on it and do a “tongari corn play”. 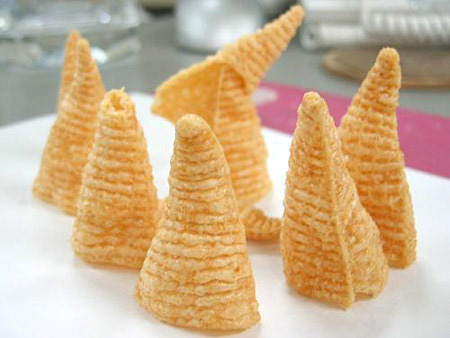 They can be played as a “stacking corn” game where you stack up the corns and the person who collapse the tower is the loser. 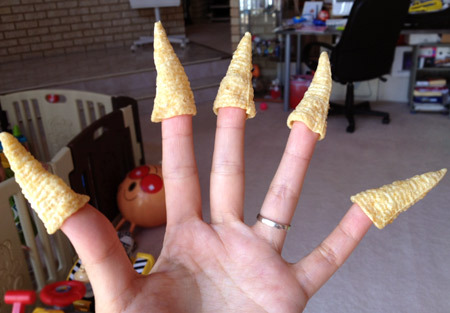 Haha, the Korean snack just reminded me of these silly things I used to do in Japan. Hehehe yeah I love it too 😀 And the Korean one was just $1.00 cheap! We have these in North America as well. 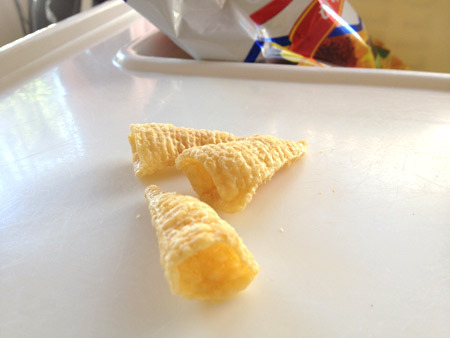 They’re called Bugles and I love them! Though I don’t eat snacks like this much at all anymore. Really?? Wow it’s interesting 🙂 Do you think the origin of the snack is Japan, or elsewhere?